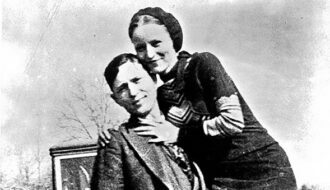 On May 23, 1934, fugitives Clyde Barrow and Bonnie Parker were captured by law enforcement officers in Bienville Parish. Notorious bank robbers Clyde Barrow and Bonnie Parker drifted in and out of northern Louisiana during the two-year crime spree that turned them into Depression-era folk heroes. Suspected of murder and attempted murder, kidnapping, car theft, and numerous robberies in a reign of terror extending across Texas, New Mexico, Oklahoma, and Missouri, the Texas couple—known to all as Bonnie and Clyde—were gunned down by a posse of lawmen from Louisiana and Texas in a highway ambush near Gibsland, in rural Bienville Parish, on May 23, 1934. Barrow was born on March 24, 1909, in Telico, Texas, and Parker was born on October 1, 1910, in Rowena, Texas. They first met in 1930, not long before Barrow was arrested for burglary and jailed for twenty months. After he was paroled in February 1932, he and Parker teamed up and embarked on a life of crime together, often in the company of Barrow’s brother, Marvin “Buck” Barrow; Buck’s wife, Iva Bennie “Blanche” Caldwell Barrow; and a third cohort, alternately Ray Hamilton or William Daniel Jones. They robbed a number of banks as well as a few gas stations, restaurants, and individuals, mostly in small towns. They were rumored to have plans to rob banks in Arcadia and Ruston, Louisiana, but one documented crime in the state occurred in April 1933 in Ruston, when they kidnapped H. D. Darby and Sophia Stone while stealing Darby’s car. They drove the couple into Arkansas and released them. As newspapers sensationalized their exploits, the gang’s mystique grew with every bold holdup, in part due to the popular view of banks as being oppressive toward farmers and others struggling through the Great Depression. Barrow, Parker, and their group never got away with more than $1,500, and in several instances they engaged in shootouts with law enforcement officers. Buck Barrow was fatally wounded in a gun battle with police in Iowa on July 29, 1933, and Blanche was captured. 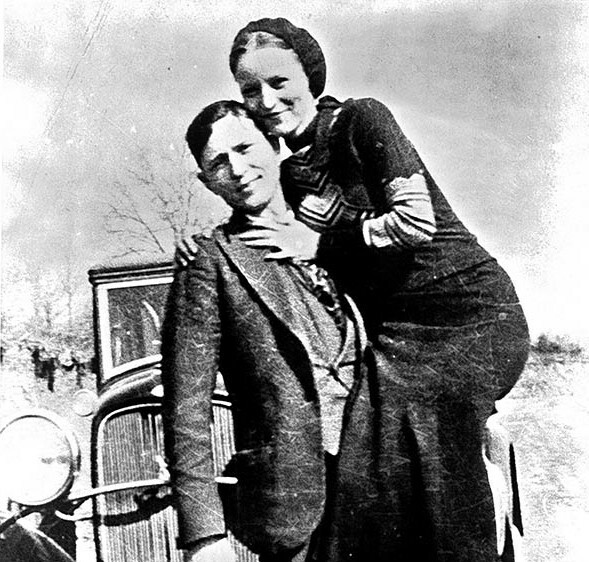 Jones was arrested in Houston, Texas, four months later, but Bonnie and Clyde remained at large. 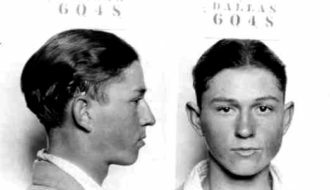 On January 16, 1934, the couple orchestrated a prison break from the Eastham State Prison Farm in Waldo, Texas, springing Hamilton and four other inmates. Among the other escapees was Henry Methvin of Arcadia, Louisiana. Methvin became the final member to join the outlaw gang. 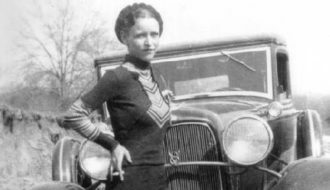 That was a fateful move because four months later it was Methvin’s connection to Bonnie and Clyde that would set the stage for the fatal ambush. The beginning of the end for Barrow and Parker came on May 20, when they got separated from Methvin at a cafe in Shreveport. A constable reported this news to the Texas officers and Henderson Jordan, the sheriff of Bienville Parish, who knew the location of Methvin’s father’s residence. Thinking that the pair might want to reunite with Methvin, the posse assembled and lay in wait in the woods for two days and two nights. On the morning of May 23, the outlaw couple picked up two sandwiches for breakfast from Ma Canfield’s Cafe in Gibsland; they then drove down Louisiana 154 en route to Methvin’s father’s home. Accounts differ as to the involvement of Methvin’s father, Ivy Methvin, in the ambush. Eight decades later, it remained unclear whether the elder Methvin volunteered information to authorities in exchange for leniency for his son or was forced against his will to take part in the setup. What is known is that Ivy Methvin’s truck was parked alongside the highway as a lure; Deputy Bob Alcorn had removed a wheel so it would appear to the outlaw couple that their gang member’s father needed help. The plan was to wait there until 9:30 a.m. As luck would have it, Barrow and Parker drove by at 9:15. Barrow was known for driving a tan V8 Ford eighty to ninety miles per hour down gravel roads. 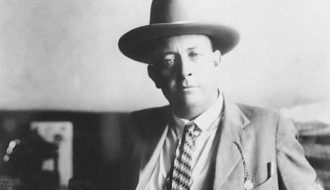 Posse member Ted Hinton from Dallas, Texas, would also help identify Barrow because the two of them had once worked together as messengers for Western Union. Barrow was said to have a sixth sense that foretold danger—but not on May 23. The chief deputy of Bienville Parish fired the opening round. Barrow and Parker were hit more than fifty times and were found leaning together in the front seat of a bullet-riddled car. From the vehicle, deputies removed carpet bags and guns that included sawed-off shotguns, automatic rifles, and pistols as well as 1,500 rounds of ammunition. In the rear seat were license plates from Louisiana, Texas, Arkansas, Oklahoma, Indiana, Illinois, Iowa, Kansas, and Missouri. Parker sported curly hair, courtesy of a new permanent wave, and clean, manicured nails; Barrow’s trimmed nails were likely due to Parker’s influence. Conger Furniture Store in Arcadia, which had a funeral home in the back, held the gangsters’ bodies until they were delivered to Dallas for funeral services and burial. Word of the outlaws’ capture spread quickly, and the town of Gibsland swelled in population—from 2,000 to 12,000, within hours—as curious gawkers streamed in from neighboring communities. The 1967 movie Bonnie and Clyde, which won two Academy Awards and was nominated for eight others, left the American public with a somewhat romanticized notion of the outlaws’ exploits. In Bienville Parish, though, local residents have not forgotten the real-life events. 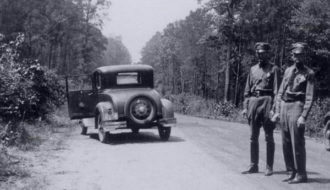 A historical marker placed by the Bienville Parish Police Jury at the site of the ambush is a tourist attraction, and the Bonnie and Clyde Festival, held each May in Gibsland, features a reenactment of the fatal ambush. The former Ma Canfield’s Café in Gibsland has been converted to the Bonnie and Clyde Ambush Museum and is operated by L. J. “Boots” Hinton, son of Ted Hinton, the last surviving member of the posse. Two years after Ted Hinton’s death in 1977, his account of the incident was published under the title Ambush: The Real Story of Bonnie and Clyde. Hinton, who carried a camera at all times, captured the ambush on film, and visitors to the museum can view the footage. 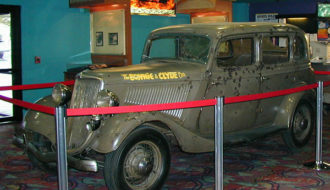 The 1934 V8 Ford, with its bullet holes from the 167 rounds fired by the six lawmen, toured the United States for years as a carnival attraction. It is now on public display at Whiskey Pete’s Resort and Casino in Primm, Nevada, along with the shirt Barrow was wearing when he was shot to death. Van Osdell, Mary Ann "Capture of Bonnie and Clyde." In https://64parishes.org Encyclopedia of Louisiana, edited by David Johnson. Louisiana Endowment for the Humanities, 2010–. Article published July 18, 2013. https://64parishes.org/entry/capture-of-bonnie-and-clyde. Hinton, Ted, and Larry Grove. 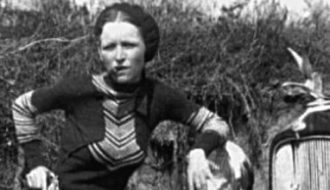 Ambush: The Real Story of Bonnie and Clyde. Austin, TX: Shoal Creek Publishers, 1979. Steele, Phillip W., and Marie Barrow Scoma. The Family Story of Bonnie and Clyde. Gretna, LA: Pelican Publishing, 2000.